The interval between buses is around 20 to 30 minutes. 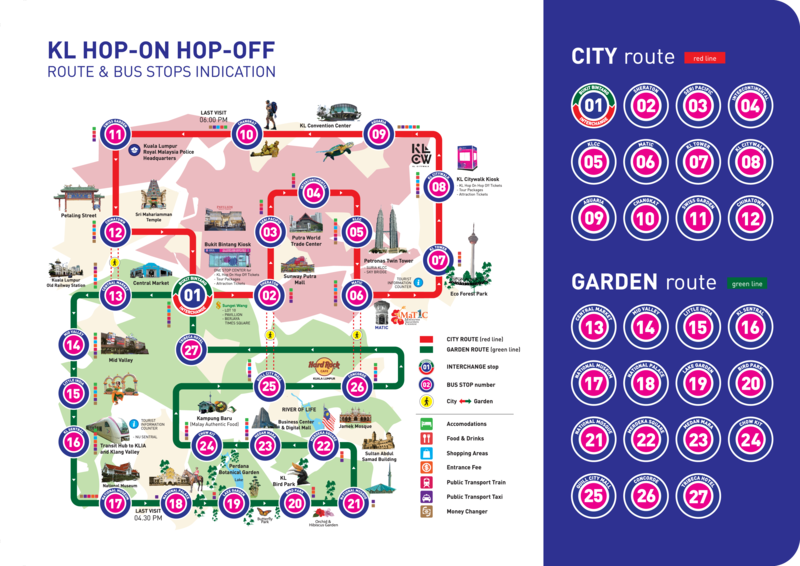 The KL Hop-on Hop- Off city tour bus is the open-deck double decker city tour bus in Malaysia, taking on the popular ‘see it all’ concept available in bigger cities such as London and Paris, but the key to the tour is that it maintains its flexibility. With 23 designated stops, and over 70 attractions throughout Kuala Lumpur, the open-deck double decker, air-conditioned tour bus is equipped with pre-recorded commentary for each of the attractions making it one of the most convenient tours around. The weather is unpredictable in Kuala Lumpur. Delays might occur during extreme weather. Please note during peak season there will be limited seating areas. Kindly start the tour early in the day to avoid any inconvenience. Try to avoid hopping on the bus during peak hours usually around 4:00PM to 6:00PM. It is advisable for you to go sightseeing or have a rest during the mentioned hours. KL Hop-on Hop-off ticket does not include admission tickets for chargeable attractions. For MyKad and MyKid holders please present your ID for boarding verification. For student rate eligibility, please present your Student ID upon boarding for verification. Children below age of twelve years old must be accompanied by adult. Please present Travelog e-Ticket at designated bus station upon arrival.